Do some cultural sightseeing at Olavinlinna Castle and Hamina Old Town. Popular historic sites such as Kerimaki Church and World Heritage Site - Verla Groundwood and Board Mill are in your itinerary. 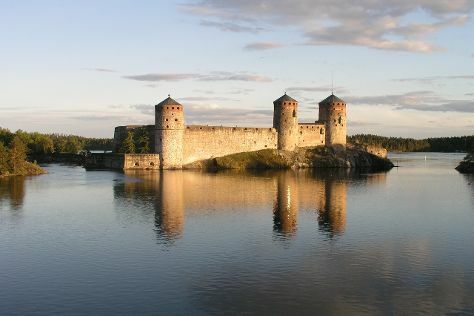 Explore Imatra's surroundings by going to Savonlinna (Pikkukirkko, Savonlinna Cathedral, & more), Lappeenranta (Saimaa Canal, Church of the Intercession of the Mother of God, & more) and Kouvola (Repovesi National Park & Niivermaki Nature Conservation Area). Spend the 5th (Wed) exploring nature at Linnansaari National Park. Spend the 6th (Thu) exploring nature at Kolovesi National Park. There's lots more to do: take in the dramatic scenery at Imatra Waterfall, enjoy the sand and surf at Lempukka Beach, learn about winemaking at Ollinmaki Winery, and cruise along Lietvesi Scenic Road. To find photos, where to stay, other places to visit, and tourist information, refer to the Imatra trip itinerary website . Expect a daytime high around 59°F in May, and nighttime lows around 42°F. Finish your sightseeing early on the 11th (Tue) so you can travel back home.